Stress echocardiogram or stress echo is a procedure used to determine how well your heart and blood vessels are working. A stress echocardiogram (or stress echo) is a procedure performed in our rooms to assess cardiac function. This is performed in combination with a stress ECG. The patients ECG and blood pressure will be monitored throughout the test. After resting images are performed by a qualified sonographer, the patient will exercise on a treadmill. The length of time required to exercise varies from person to person and takes into account the persons age and fitness level. The exercise component usually takes between 5 and 10 minutes. 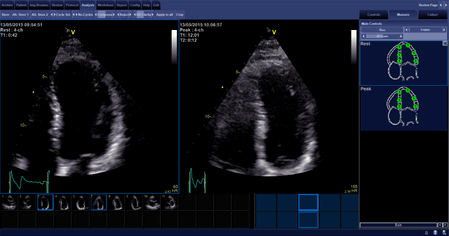 The sonographer will then take more pictures of the heart post exercise to compare the heart function to the resting images. This test is safe and non-invasive. The patient will be closely monitored in a fully equipped exercise lab by experienced staff throughout the procedure. Results are available to the patient immediately after the procedure. Compared to stress ECG alone, a stress echo has much better diagnostic accuracy. Diagnosing coronary artery disease and assessing the risk for heart attacks early on can help prevent future complications.